This was written by one of our communicators when he/she ws 9 yars old Name the communicator? In 1954, Colonel Gamel Abdul Nasser replaced General Neguib. He had three goals: to make Egypt independent by ending British occupation; to build up Egyptian forces for a successful attack on Israel; to improve Egypt’s economy by constructing a high dam at Aswan to irrigate the Nile valley. On 19 October 1954 a treaty was signed by Nasser and by Anthony Nutting, British minister of state for foreign affairs. The agreement was to last for seven years. British troops were to be withdrawn from Egypt by June 1956, and the British bases were to be run jointly by British and Egyptian civilian technicians. Egypt agreed to respect the freedom of navigation through the canal, and it was agreed that British troops would be permitted to return if the Suez Canal was threatened by an outside power. In February 1955, Anglo-Egyptian affairs were strained once more by Eden’s decision to deprive Nasser of promised British arms. In April, Eden succeeded Winston Churchill as prime minister. As the last British troops left Egypt, Nasser was completing the purchase of Soviet-made aircraft, tanks and arms from Czechoslovakia, which might help him to realise one of his goals, the destruction of Israel. Despite anti-western demonstrations in Egypt, in January 1956 the United States and Britain had pledged funding to help finance the construction of a new High Dam at Aswan. The US, however, became convinced that the Dam project would not be a success and wanted to reduce expenditure on foreign aid. It was also concerned about Nasser’s purchase of Soviet arms. On 19 July, US Secretary of State John Foster Dulles informed the Egyptian ambassador in Washington that his government had decided that it would not provide funding for the construction of the dam. The British foreign secretary, Selwyn Lloyd, followed suit and withdrew the British offer of aid. The World Bank then refused to advance Egypt a promised $200 million. On 26 July 1956, President Nasser nationalised the Anglo-French Suez Canal Company, declaring that he would take the revenue from the canal to finance his dam. British civilian technicians (my father included) and their families arrived in Egypt toward the end of 1955 to start their six year contract and we landed at a former RAF landing strip near Fayid, Suez Canal, Egypt. There were no Customs, Immigration, etc – only a fuel tanker, a couple of British army buses and trucks. We had to get off the plane at the front end using a long ladder, provided by the British soldiers. We were then driven to a former British Army camp at Fayid and billeted at our respective quarters. The only British Army units still in the area were some Army Service Corp personnel and a Royal Signal Corps squadron. They all left within a month leaving us civilians to our own devices. I think there were about 1200 British civilians (including women and children) at the camp based on information that I have gathered. There was a former British Armed Forces Club on the Great Bitter Lakes (Suez Canal) called The Vic Lido. Typical British Raj days – Big sweeping club rooms, with the outside area having tables, chairs and umbrellas. A long wooden jetty went out into the lake and connected to an old shipwreck. Ideal for diving off the old wreck and looking at the exotic fish. My father knew an Egyptian from his days in Egypt after WWII when he was seconded to Middle East Land Forces (Cairo) in 1947 for his briefing prior to posting to Cyprus the following year. We went to Cairo a couple of times to visit his old friend. My Father had purchased a brand new car, which he treated as his pride and joy and on our return from our second visit to Cairo, we ran into trouble. As we passed through several villages, we were greeted with rocks, camel dung and other bits and pieces thrown at our car. My father kept his foot on the accelerator and we finally got back to Fayid, shaken but safe. This was in June 1956. Our camp was about a 200 yards from the main railway line which ran parallel to the Suez Canal and the Great Bitter Lakes and soon we noticed large troop movements and tanks being transported north to Port Said which was at the mouth of the Mediterranean. In July, President Nasser decided to nationalise the Suez Canal, which had been under the control of the British and French, because the British government and US reneged on deal to finance the Aswan Dam project. 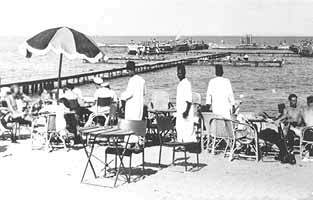 Anyway, things hotted up and in August, Britain evacuated all British subjects working/living along the Suez Canal. This was known as “Operation Nursery”. Solent flying boats from Aquila Airlines came alongside the Jetty at the Old Vic Lido, starting on 14th August, and flew out the women and children (my mother and I included). The men were taken prisoner (471 of them) and taken to the civilian jail in Cairo. Our flying boat landed at Malta, where we spent the night, and then we flew onto Southampton the following day where we greeted by hundreds of well-wishers and the news media. After a couple of nights in Southampton, we then went on to stay at my maternal grandparents place in Bournemouth for a short while before we got our own flat. Meanwhile, in November 1956, the British and French invaded Port Said, Egypt, and during the operation, 471 Egyptian civilians were grabbed off the streets and used to trade for the British prisoners. This took some time and in December, the British civilians were flown to Cyprus and then finally on to the UK. My father was given a railway ticket from Waterloo to Bournemouth for the value of twentyfive shillings and sixpence and then the taxi fare of seven shillings and sixpence to where we were living and he arrived on our doorstep 23 December 1956. All in all, my father was given an advance of fifty pounds from the British Government. All our savings, etc, which had been in an Egyptian bank were gone forever.